Is the cloud ready for sensitive data? You bet it is. Some 90% of businesses in a new survey say that at least half of their cloud-based data is indeed sensitive, the kind that cybercriminals would love to get their hands on. The migration to the cloud can’t come soon enough. About two-thirds of companies in the study say at least one cybersecurity incident has disrupted their operations within the past two years, and 80% say they’re concerned about the threat that cybercriminals pose to their data. The good news is that 62% of organizations consider the security of cloud-based enterprise applications to be better than the security of their on-premises applications. Another 21% consider it as good. The caveat: Companies must be proactive about their cloud-based data and can’t naively assume that “someone else” is taking care of that security. Those insights come from a brand-new threat report, the first ever jointly conducted by Oracle and KPMG. 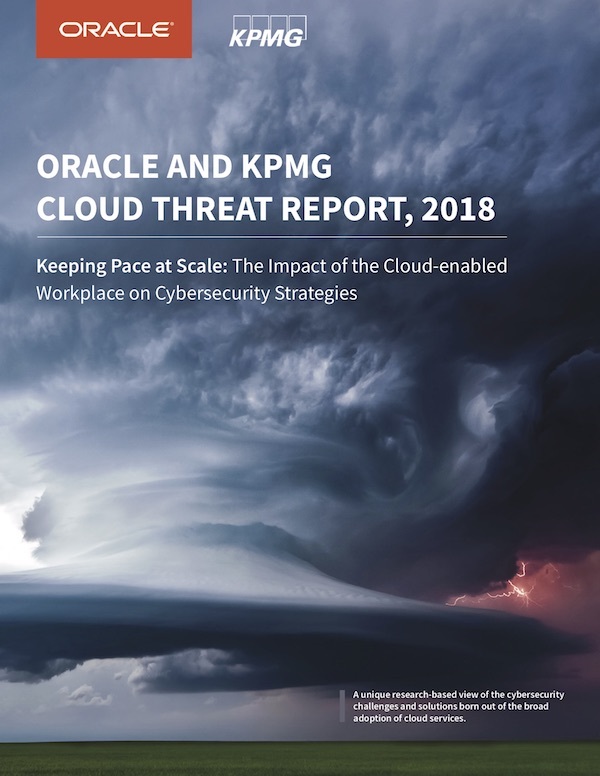 The “Oracle and KPMG Cloud Threat Report 2018,” to be released this month at the RSA Conference, fills a unique niche among the vast number of existing threat and security reports, including the well-respected Verizon Data Breach Investigations Report produced annually since 2008. Indeed, 87% of the 450 businesses surveyed say they have a cloud-first orientation. “That’s the kind of trust these organizations have in cloud-based technology,” Jensen says. 20% of respondents to the survey say the cloud is much more secure than their on-premises environments; 42% say the cloud is somewhat more secure; and 21% say the cloud is equally secure. Only 21% think the cloud is less secure. 14% say that more than half of their data is in the cloud already, and 46% say that between a quarter and half of their data is in the cloud. That cloud-based data is increasingly “sensitive,” the survey respondents say. That data includes information collected from customer relationship management systems, personally identifiable information (PII), payment card data, legal documents, product designs, source code, and other types of intellectual property.